„It is said that just as the Buddha was close to approaching awakening, his nemesis Mara appeared, desperately determined to stop him. Mara’s attack centered on the Buddha’s body, first with sensual temptations, next with threats of harm. This lurid archetypical scene—the Buddha serenely sitting, Mara’s minions hurling arrows and flames—is the very image of the human drama. Our bodies are under attack. Flesh is vulnerable. And yet, if we are determined, wise, and strong, we can avoid defeat. Like the Buddha, we can not only endure; we can heal and transcend. We can become enlightened beings. The Buddha is often called the Great Healer. He is the ultimate physician, providing medicine to cure the human disease. His four noble truths follow the classical medical model of diagnosis, treatment, and cure. In their classical formulation they are: 1. The truth of suffering (diagnosis); 2. The truth of origination (cause); 3. The truth of stopping (cure); 4. The truth of the path (treatment). The diagnosis is drastic: “All conditioned existence has the nature of suffering.” That is, we human beings are inherently ill, even when we think we are not. What we think of as health isn’t really that, for beneath our apparent health, illness lurks. The Buddha asserted that our disease can be cured. Illness is the basic human condition. The cause of this condition is desire, which includes not only sensual desire but even the very desire to remain healthy and to stay alive. As long as we cling and grasp we will suffer, because nothing can be held onto. Everything changes, slipping away moment by moment. Since we can never eliminate desire, our condition seems hopeless. Yet the Buddha asserted that our disease can be cured. That is, though desire can’t be got rid of, it can be clarified and transmuted. Healing is possible. The fourth truth, the path, outlines the course of treatment—a thoroughgoing way of living and understanding that will bring us to full health and wholeness, if only we practice it with diligence. This straightforward program sounds good to us empowered modern people conditioned by generations of scientific know-how and progress. We believe that health is good and illness is bad and can be eliminated. With enough effort and energy, and with good doctors and psychotherapists, we can, like the Buddha, overcome suffering. We can defeat Mara. But notice that in the gentle stories of the Buddha’s life, as told in the Pali suttas, Mara is never entirely defeated. He appears throughout the Buddha’s lifetime, constantly trying to foil the great sage. According to Thich Nhat Hanh, in one traditional tale Mara becomes discouraged, and the Buddha tells him, “Mara, don’t quit! I need you. Without you I can’t be Buddha.” Buddha and Mara depend on one another. What is health? What is illness? In the modern medical model, health is the default, the norm. When I get my blood test, I want to hear that all my indicators are in the “normal” range, which means I am healthy. Illness is, by this definition, abnormal. But as the first noble truth implies, there is no ultimate physical health. The human body can’t be perfectly free of impediment. There is always something more or less wrong. Even a child has bumps and afflictions, and throughout our lives illness and health are constantly jockeying for dominance. What we call health is simply a brief period of homeostasis. Even a person who seems to have preserved this homeostasis for a lifetime will undergo aging, in which physical vitality gradually decreases until it breaks down entirely and death occurs. Health is an illusion. “Health” and “healing” literally mean “wholeness.” Wholeness implies inclusion of everything—of well-being as well as illness, the good along with the bad—into a larger sphere. In spiritual cultures, notions of healing and health always evoke a category larger than physical and psychological well-being, though physical and psychological well-being are included in it. People may imagine that after his awakening the Buddha lived a healthy, happy, trouble-free life. But the Buddha’s life after his awakening was not trouble-free. There were moments of frustration with fractious members of his community. There was the sorrow of trying and failing to stop impending wars. There were physical problems too. Later in his life the Buddha complained of bellyaches, backaches, and general weariness. The Buddha’s fundamental and unshakeable well-being went beyond the condition of his body and mind. So, the Buddha was not always healthy and happy in the conventional sense. But this did not obviate the strength and thoroughness of his awakening. For even in the midst of problems, the Buddha remained ultimately healed. He didn’t expect to transcend the limitations of his body and mind. In wisely accepting and fully understanding the vulnerability of his physical existence, he was whole. His fundamental and unshakeable well-being went beyond the condition of his body and mind. This more profound sense of health is implied in the four noble truths. Notice their traditional order: suffering, cause, cure, path. This is counterintuitive. The natural order ought to be suffering, cause, path, cure. This is what we expect from the doctor—that once she figures out what we’ve got and prescribes medication, which we carefully take, we will be cured. But the end point of the Buddha’s analysis isn’t the cure, stopping. It’s the treatment, the path. So, curing is not the goal; it’s an aspiration, a hope, a faith. The path goes on and on; it has no endpoint. 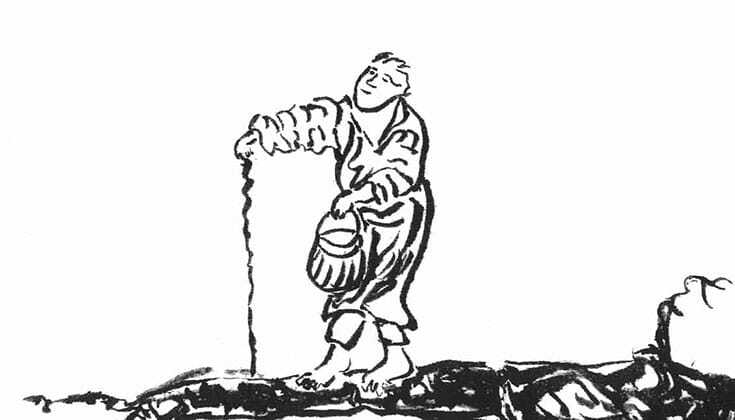 The Buddha’s biography bears this out: he doesn’t stop treading the path after he awakens. He doesn’t just enjoy himself and go on to other things. Instead he continues to practice the Way for and with others for the rest of his life. He doesn’t defeat Mara. Their dance goes on. If there is a cure, this is it: delight in the ongoing dance. Let’s return for a moment to the scene of Buddha’s awakening. In response to Mara’s physical attacks, the Buddha is said to have touched the earth. In doing this, the Buddha was not only calling on the Earth Goddess to be his protector. He was also saying, “The earth is my body. My body expresses earth; it’s produced and supported by her. So, as long as earth exists, nothing, even what looks like complete destruction, can threaten my body. Even if pierced and broken by your arrows and flames, even when succumbing to illness and death, my body continues to circulate and flow, returning home to its source and mother, the great earth, which has always embraced it.” With this earth-touching gesture, Mara and his forces were dispelled. “You need not worry, Evil One,” the Buddha replied. 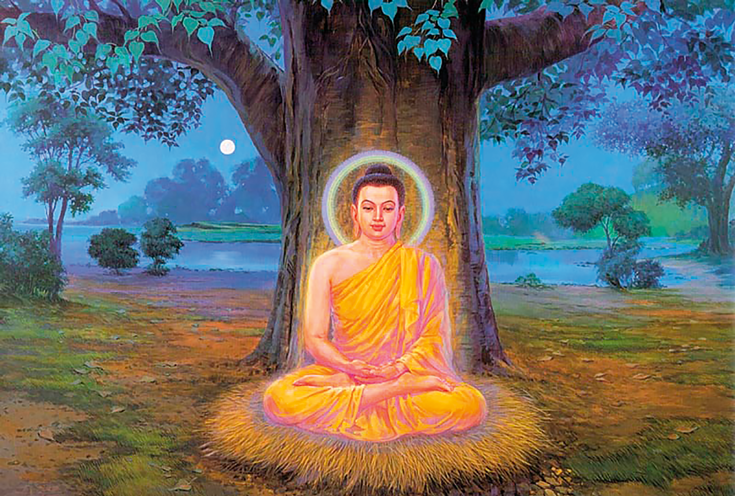 “Three months from now I will take final nibbana.” And three months later, suffering from a severe bellyache with diarrhea, the Buddha laid down between two Sala trees. Surrounded by tearful disciples, he breathed his last. Mara finally won, as he always does. The worldview of the Buddha’s ancient Indian culture was the opposite of ours. We are radical materialists with an impressive record of mastery of the physical world. This makes us life-affirming and optimistic. As best we can, we try to avoid the inconvenient fact that we die. We say, why obsess about it? Death comes later, after a long happy life. There’s no use spoiling things by thinking about it. That would be morbid. Anyway, science will stave off death for a long, long time. The best doctors can cure even the worst diseases, and they are discovering new cures every day. Perhaps we will even be able to eliminate death at some point. Who knows? Scientists are working on it. The ancient Indian view of life and death couldn’t be further from this. In ancient India, life was not long and happy; it was brief and brutal. The daily struggle to survive was arduous and miserable. Disease, starvation, and crushing poverty were the fate of most people. And, as the ancient Indians saw it, even at the end of this terrible lifetime there was no escape. We leave this life only to wander for a time in hideous post-life realms from which we will be reborn into yet another miserable life. This diabolical process goes on and on and on. The goal then, according to ancient Indians, is not to prolong life; it’s to end this painful process once and for all. This is nibbana: final peace, complete rest, freedom from the beginningless cycle of birth and death. The word nibanna means “to blow out,” as in blowing out a flame and entering peaceful darkness. Nibbana isn’t death; it’s the opposite of death. Life and death are restless and painful; nibanna is completion, fulfillment. 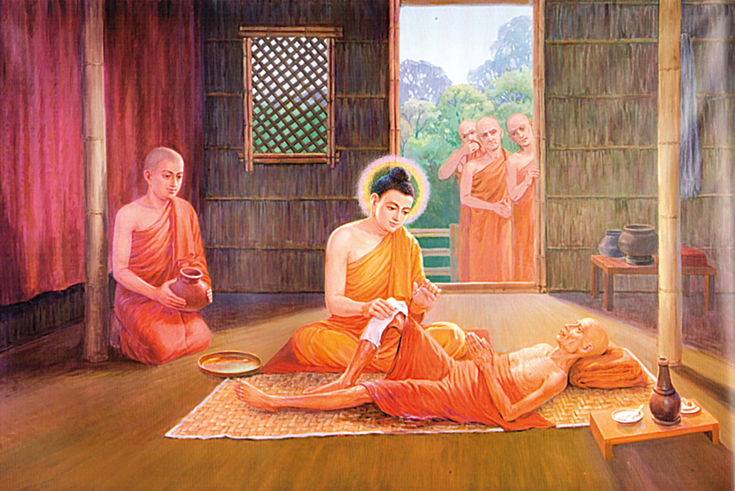 Though old and infirm, the Buddha did not succumb to illness; he transcended it. In entering nibanna he became whole. For the Buddha, what we call death is ultimate healing. Though the metaphor is the mirror opposite, the nibanna proposed by the Buddha may not be so different from the Christian conception of heavenly eternal life after death. To be sure, nibanna isn’t the only goal of early Buddhism. Even in the midst of life’s unpreventable difficulties, suffering can be reduced by following the Buddhist path. Though we can never eliminate illness and harm, we can reduce the self-inflicted suffering we ourselves produce when we take a bad situation and make it worse through our resistance and unwise behavior. A lifetime of such exacerbation is normal for most of us. It leads to all sorts of bad effects, from making enemies we don’t need to make, to ruining our physical health with bad habits and too much unnecessary stress. If, on the other hand, we practice meditation, ethical conduct, and the other Buddhist virtues, living mindfully and harmoniously, we will have community, cooperation, peace, and love, which will promote and extend our life. Even when the body can’t be healed, the soul can be. Such is one view of the path set forth in the Buddhist scriptures. It’s the view emphasized in Western Buddhism and in the Buddhist-inspired mindfulness movement. Buddhism is good for you; it accords with the healthy life we all want. And yet, in Asia throughout the ages, beginning with the Buddha, who nearly starved himself to death, sages put their lives at risk in pursuit of the Way. Why? As we’ve said, in Buddhism, as in all spiritual cultures, there is an overlap between what we usually think of as physical and emotional wellness and the greater healing promised by ultimate commitment to the path. The Buddhist teachings, as they are interpreted in the West, accord with current scientific research, which has been influenced by them. But the traditional Buddhist canon is full of miraculous stories of physical and emotional healing effected merely by the Buddha’s presence. Jesus and other saints also had the power to heal the sick, and tent revival preachers still cause the blind to see and the lame to throw off their crutches and walk. Faith heals the body and heart by healing the soul. So yes, whether rational or not, spiritual traditions are concerned with our ordinary well-being. But even when the body can’t be healed, the soul can be. Putting us “right” with our inmost hearts, regardless of our physical condition, is the larger goal of all religious traditions, including Buddhism. If we cling too tightly to physical and emotional healing as our goal, we won’t be able to find spiritual healing when we need it most. Like the Buddha, we can heal, we can become whole, even when we are ill, even as we let go of our life. Widening the concept of healing in this way necessarily widens our sense of who and what we think we are. If we are the body, and the thoughts, feelings, and memories associated with it, then we’ll want to preserve the body at all costs, and, thus, ordinary healing will be of utmost importance. But all religions, including Buddhism, teach that we are more than the body and its associated mental and emotional states. In Buddhist terms we are also, perhaps most saliently, buddha or buddhanature—awareness itself, luminous consciousness. The Buddha affirmed that “this Mind, O monks, is luminous, only it is obscured by adventitious defilements from without.” The path purifies these defilements, enabling the luminous mind to shine forth unobstructed. In the later mind-only schools of Mahayana Buddhism, there is much teaching about the nature of this mind, and there are deep meditation practices to help guide us to it, insofar as this is possible. Clearly, mind is not something inside our brains. It is not a state or a condition. It is inside, outside, and everywhere else. It exists and it doesn’t. In the light of Mahayana teachings like this, the point of the path is to appreciate that this is what we are—as much as, and even more than, the body and its mental and emotional concomitants. To affect this identity shift will enable us to die as the Buddha did—fully and with perfect healing. This is the goal of the Mahayana path. In Mahayana Buddhism, recognition of this ultimate form of healing, beyond the body and sense of self, has an altruistic and communal dimension. If my body is the sacred instrument through which I appreciate, as the Buddha did, that I am embraced by and identified with both life and death, then I will understand that my desire to be and have more is a painful projection of my fear and separation, born of the ignorance that has caused beginningless suffering. Feeling life in this way, I can’t continue to be selfish. I’ll be motivated by love for all sentient beings, who are my true self, and I will care for them, protect them, and grieve for their losses and pain. To fully live with such a spirit, regardless of my own condition, is the ultimate form of healing. „You have been alive a long time. Your eyes have seen any number of forms and colors, your ears have heard so many sounds, and you’ve had any number of experiences. And that’s all they were— just experiences. You’ve eaten delicious foods and all the good tastes were just good tastes, nothing more. The unpleasant tastes were just unpleasant tastes, that’s all. If the eye sees a beautiful form, that’s all it is, just a beautiful form. An ugly form is just an ugly form. The ear hears an entrancing, melodious sound, and it’s nothing more than that. A grating, disharmonious sound is simply so. From "Advice for Someone Who is Dying"
Tot ce întâlnesti este parte din drum. Drive all blames into one. What it is saying is: whatever happens, don’t ever blame anyone or anything else; always blame only yourself.